Russ founded Charlottesville Handyman Services, LLC in 2004. As he was teaching a unit on Entrepreneurship to his Advanced Marketing class he discovered the handyman business. Russ has always liked fixing things and has spent the past 30 years doing home improvement projects. Wow! There was actually a business doing what he loved to do. As Russ was finishing a Masters in Education, he realized that he didn't enjoy teaching anymore. Russ decided to follow his heart and start Charlottesville Handyman Services. He had previously had his own insurance business and always wanted to return to business ownership. Russ founded Charlottesville Handyman Services with a simple motto, "Honest, Reliable Service". This is what he found missing in the construction industry. Many people just don't do what they say they are going to do. Many of us have been disappointed with businesses not calling and showing up when they say they are going to. We also believe in doing things right the first time. No one is perfect, but you have to have high standards and be willing to do things right. We believe our customers deserve to have high-quality work done at reasonable prices. Russ was a teacher at William Monroe High School from 1996 to 2004. He taught Marketing and Business classes, as well as being the Webmaster for the school website. While at Monroe, Russ was also Yearbook Advisor, DECA Advisor, Technology Training Coach, InteGrade Teacher Trainer, G.E.D. Teacher, and P.V.C.C. computer instructor. He was born in Dayton, Ohio and lived there ﻿until the 8th grade﻿. Russ finished school in Hampton, Virginia and graduated from Kecoughtan High School in 1982. He earned a B.S. degree in Marketing Education from Virginia Tech in 1987. Russ completed a Masters in Education with an emphasis on Integrating Technology in the Classroom from Walden University in 2004. He originally taught Marketing at Madison County High School for five years. While at Madison, he started and coached the wrestling team for two years. He then left teaching for four years. During that time he had a business selling insurance and investments for Lutheran Brotherhood (Now Thrivent), a fraternal benefit society for Lutherans. After doing that for three years, Russ was in management training with Eighty-Four Lumber for 15 months before going back to teaching. 84 Lumber had a rigorous training program that gave him a solid foundation in building fundamentals. Russ is married to a former teacher, Angela, and has four grown children. He enjoyed doing things with his kids; coaching and/or supporting them in baseball, soccer, swimming, basketball, Destination Imagination and Cub Scouts (Russ volunteered as webmaster). He also enjoys running, golf, tennis, and juggling. Russ completed two marathons (OBX and Richmond) and several half marathons. He is an active member of Peace Lutheran Church, the praise band, Honduras Mission teams, Southwest Virginia Mission teams, and formerly served the local jail ministry. Leivi joined Charlottesville Handyman Services in 2017 after two decades in the home repair, siding, and painting industries. His talents include trim and finish work, drywall, and custom build projects. His attention to detail earns him the respect of his customers time and time again. Leivi was born and raised in El Salvador. He is an active father, and loves to play soccer and spend time with his family. In his spare time, he helps friends and his community with home repair projects. Lisa joined Charlottesville Handyman Services in 2017 after ten years in outside sales and advertising. Lisa enjoys helping her team members stay organized and on track with customer projects, and strives for honest, reliable customer service. In her spare time, she winter-backpacks, gardens, and helps family with home repair projects. 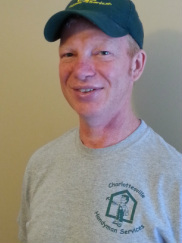 Lew joined Charlottesville Handyman Services in 2019. After retiring from a varied career, he decided to return to his first passion, building construction. Lew holds a BS degree in Industrial Arts and spent his early career as a high school teacher. He left teaching to open a licensed building construction and consulting firm and has operated that business for 35 years. During that same period Lew obtained an MS degree in Community Health Promotion from WVU and worked as an Outreach Services Director for a small rural hospital, the Executive Director of the Wellness Council of WV, a WVU Extension Agent, and finally the Executive Director of the Northern WV Rural Health Education Center. Lew's excited to be a member of the Charlottesville Handyman Services team and add his estimating abilities to contribute to its success. Lew and his wife, Nancy, have five children and eight grandchildren. In addition to enjoying the spirit and buoyancy they all bring to his life, Lew enjoys devoting energy to gardening, hiking, biking, listening to good music, woodworking, keeping up and staying engaged with current events, and through it all, enjoying life. Eddie joined Charlottesville Handyman Services in 2019. Jay joined Charlottesville Handyman Services in 2019.